I’m excited to support Erin Murphy for Minnesota governor this year. Really. There’s an energy around her campaign and I like where she stands. Minnesota has a crowded primary this year, with multiple candidates in both parties vying for governor and other major positions. So it’s important to vote in the primary on Aug. 14, 2018. We’ll see if we can touch the most-recent high turnout of 20% from 1998 (or top 1994’s 27%?). I don’t think I’ve ever been excited for a governor’s race. Even in 1998 when Jesse Ventura came out of nowhere to win it, I was still a Michigan resident and not paying much attention to Minnesota. I’ve been happy with current Governor Mark Dayton, but he never excited me. But I’m excited by Erin Murphy. Early on in the endorsement race I liked Rebecca Otto. I wasn’t paying much attention to Murphy, but I heard her speak at a local event and she grabbed my attention. She has an enthusiasm and energy that’s infectious. #PoliticsOfJoy is a thing. Murphy figured out how to campaign by door knocking and talking to people (she told me she started out on the phones and was terrible). She said if you listen more than you talk, you’re doing it right. Forming those connections with people is so important. That energy has prompted me to go door knocking and marching in parades for Erin Murphy. I’ve never done that for a politician before this summer. I had no desire to door knock. Now, I’m eager to do it because she’s a candidate I believe in. Our family has marched in multiple parades for Erin Murphy. Here we are at the Rondo Parade. Then there was the unfolding sexual misconduct controversy with #metoo and two members of the Minnesota legislature stepping down over allegations of sexual harassment and abuse. I watched as Erin Murphy was a strong voice for the victims, speaking up to protect them and demanding changes. This should be a no-brainer issue that everyone supports. But that’s just not the case. The legislature didn’t make any changes to better protect victims—or even create a process that would force investigations and allow us to see justice (instead we get “resign out of shame”—which doesn’t give victims justice and doesn’t even offer a process for the accused). But Erin Murphy has been willing to be vocal on this issue. Even when backlash in the face of Al Franken’s resignation made this issue a challenge on both sides. For me, that shows a lot of character in Erin Murphy. She gets why this is an important issue and she’s willing to fight for it. Healthcare – We need to keep working to improve healthcare. As a nurse, Murphy understands how the system works, and I think that will be invaluable as we work toward better solutions in Minnesota. Education – In the legislature, Murphy worked to make all-day kindergarten the standard across the state. That made a difference for our family. She’s continuing to push for important changes, from supporting teachers to confronting Minnesota’s achievement gap. LGBTQ Issues – Since Trump’s election I’ve listened to fear intensify in my LGBTQ friends. They wonder if their basic human rights will be protected—that’s a serious and legitimate concern. Murphy worked to pass gay marriage in the legislature and she’ll be an important voice to protect Minnesotans no matter what Trump does in Washington. Taxes – Everyone freaked out about Dayton raising taxes. They said business would flee and the state would crash. Didn’t happen. Instead we had more margin to do the work that needed to be done. I’m fine with paying a little more if it means we can take better care of each other. The alternative, cutting taxes to spur businesses—well, it failed in Kansas. This hasn’t been a huge issue this year, but I think it’s important to point out where DFL policies have succeeded. Gun Control – Since Parkland, we’ve had a new conversation about gun safety in America. Surely we can do something to stem the tide of death. Murphy has long been in favor of common sense solutions to gun violence. It’s not taking away guns, it’s enforcing reasonable limitations. Immigration & Refugees – While both Republican candidates want to cut off refugees, Murphy recognizes that it’s part of our Minnesota character to take in refugees. Many of those refugees get back on their feet and contribute far more than they ever took. I see it in my church all the time. Murphy also recognizes that immigration is part of what made America—and especially Minnesota. Instead of racist fear mongering, we need to welcome immigrants and recognize the invaluable contributions they make to Minnesota. Black Lives Matter – Erin Murphy made a strong statement on the police shooting of Thurmon Blevins. She’s the rare candidate who recognizes the real fear in the black community from police violence. It’s a difficult issue, and even acknowledging it raises people’s hackles. Murphy isn’t out there giving easy answers, she’s engaging on tough issues. This is the number one question I hear about Erin Murphy: Can she win outside of the Twin Cities? Some friends raised this concern, and I heard it from a couple people while door knocking. I asked Murphy about it when I came back from my door knocking shift (yes, that’s the fun thing about volunteering with the campaign—you actually get to interact with the candidates). Murphy said she’s only asked that question in the metro. Outstate people don’t ask that. Instead they’re focused on the issues that matter to them. The number one issue Murphy hears about is healthcare, and people outstate rally to her approach. Issues matter more than geography. And Murphy has been outstate listening to people more than her opponents. She’s out there doing the work to win. And can she win? A recent poll showed that all three DFL candidates could beat GOP front runner Tim Pawlenty. I’m also excited about Erin Murphy’s pick for lieutenant governor, Representative Erin Maye Quade. If you thought it was weird being excited about a governor’s race, how about being excited about lieutenant governor? But I’ve followed Maye Quade’s rise with interest. A former staffer for Keith Ellison, she won her Minnesota House seat in 2016 by flipping a red district blue. She orchestrated a sit in against gun violence at the capitol and has worked across party lines on issues like childhood hunger. And much like Erin Murphy, Maye Quade has an electric personality. Watching her interact with my kids at the Lakeville parade, I could see she has a way with people. Lt. governor candidate Erin Maye Quade talking to my kids about books at the Lakeville parade. I’m big on people making informed choices, so let’s talk about the other candidates for a moment. First of all, let’s cover who I’m not talking about. I’m not interested in the GOP primary. Jeff Johnson and Tim Pawlenty have the same failed ideas, as far as I’m concerned. I don’t have anything bad to say about Walz. I think he’d do fine. I could probably get excited about him, but I’m just so much more energized by Murphy. I do have concerns with Swanson. I think she did great as attorney general, but her entire approach to running for governor was flawed. By dropping out of the attorney general race when she did, she did a disservice to all the other people considering a run (who stepped aside when she announced her reelection bid). She’s basically put two and a half months into her run for governor. That seems ridiculous. The sexual harassment issues with her running mate Rick Nolan are also concerning. Nolan didn’t seem to take these issues seriously or realize that he’s done something wrong. And Swanson hasn’t taken it seriously either. Finally, there’s the fact that Minnesota has never had a female governor. Erin Murphy could be the first (so could Lori Swanson). I’ve talked about the possibility of a female governor before and women in Minnesota politics in general. Representation matters. Talking to my 12-year-old daughter about politics, she’s absolutely flabbergasted that we’ve never had a female governor, president, etc. It sounds completely stupid to her, and she’s right. Whenever I talk about this, people quickly jump all over me and accuse me of reverse sexism, as if I’m making my choice based on gender and gender alone. That couldn’t be further from the truth, and it’s pretty telling about the people who make those claims. Proof that I’m not basing my decision on gender: While I’m voting for Murphy, if I had to choose between Walz and Swanson, it’d be Walz. No contest. It’s about time Minnesota had a female governor, and I think Erin Murphy is a great candidate. Representation matters. I don’t base my vote on that alone, but it’s an important consideration. That poll I cited earlier shows Walz and Swanson neck and neck, with Murphy behind. But more than a third are still undecided, and they’ll sway the race. I think both Walz and Swanson have a big name recognition advantage, but Murphy has energy. 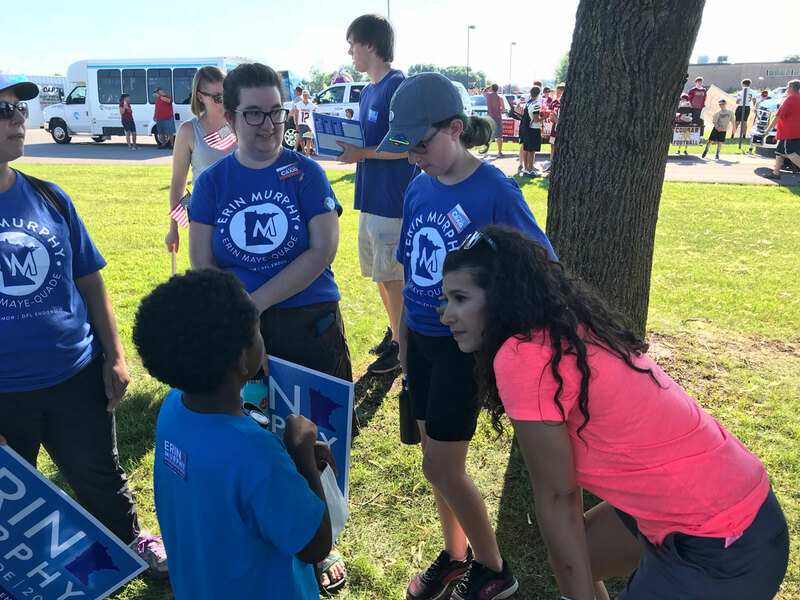 I watched as Murphy went from a distant third in the straw poll to winning the DFL endorsement, and I think it’s clear she can build momentum and win over voters. The primary is August 14, 2018. Have a voice in the process. Please vote. 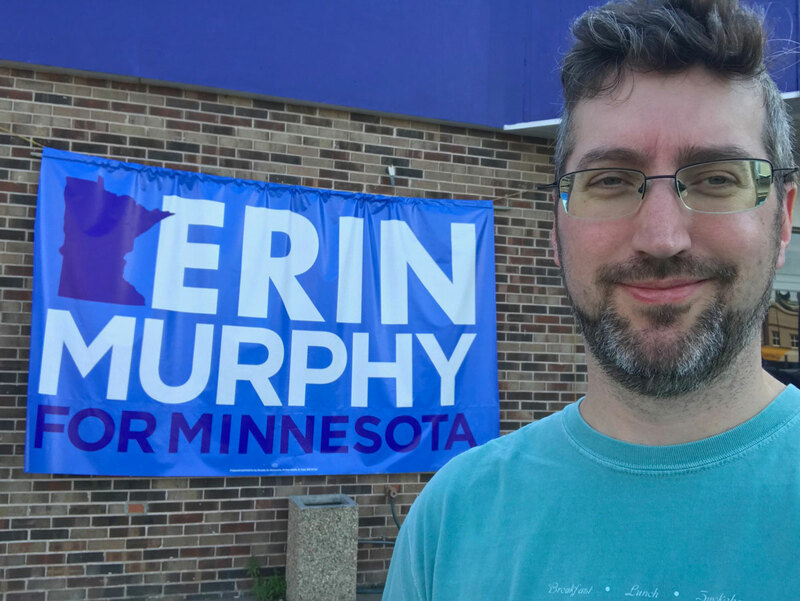 My first time door knocking for Erin Murphy. 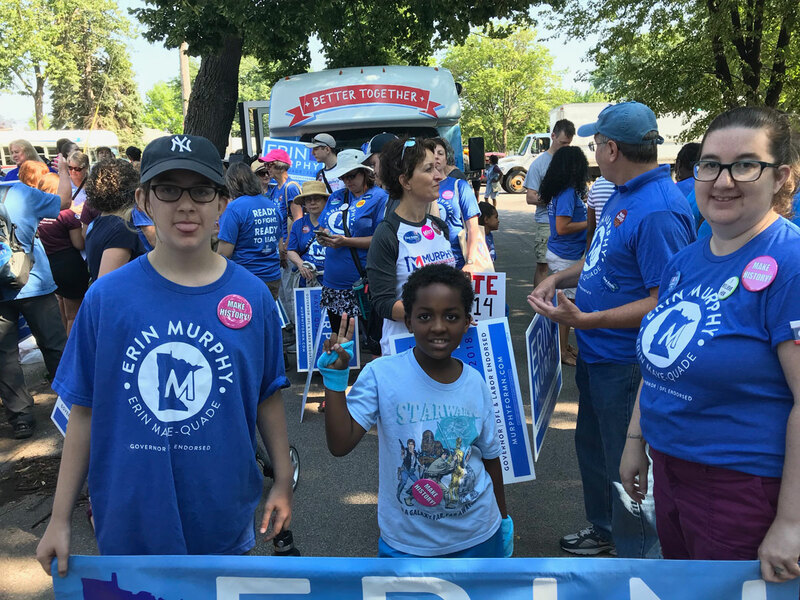 Check out Take Action Minnesota’s Busy Voter’s Guide to the Primary Election for more on Erin Murphy. Great articulation of why Erin is the right choice. Thanks for writing it. I hope you don’t mind that I posted it to my Facebook page as well. We need to get this woman elected! Colleen, thanks for the kind words. And feel free to share away!